Did you know that John F. Kennedy commissioned an entire study to determine the most effective handshake? And with good reason! More than just a sign of friendship, your handshake speaks volumes about who you are as a person. A soft hand shake can indicate insecurity. A quick-to-let-go handshake can convey arrogance. Kennedy knew that he would be shaking hands with the world’s most powerful men and women and as such he wanted to get it right. We should endeavor to do the same. In this post I am going to give you a few tips on how to shake hands like JFK. We all know that first impressions last and it is often your handshake that makes the first impression. The origins of the handshake? As with most human behaviors, the origins of the handshake seems to predate recorded history. 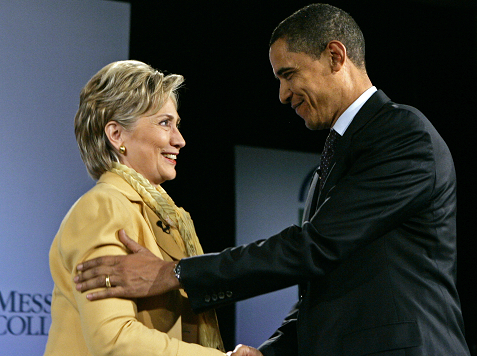 We can never know for certain where the handshake originated or why people started doing it. However, there are a few plausible theories. The most widely accepted theory is that hand shaking originated in medieval Europe where knights would extend their hand to other knights in order to show that they had no weapons hidden or concealed behind their back. This seems to fit quite nicely with the modern version of a handshake – two people using one single gesture to convey friendship, openness and non-harming. Regardless of its origins, the handshake has become a solid part of modern life and culture. People of all races, shapes, sizes and status use the handshake as a way to greet a person, make an agreement or say goodbye. Why is our handshake so important? As I mentioned earlier, the way you shake hands speaks volumes about who you are as a person. For some people a handshake is just a useless formality but to others it is a massive indication of a person’s depth of character, trustworthiness and strength. When you shake hands with a person you are doing much more than saying “hello”. You are saying “this is who I am“. Imagine a leader like John F. Kennedy who was in power during a time of worldwide nuclear uncertainty. A weak handshake with a Cuban or Soviet dignitary could create great problems for the United States as a whole. A strong handshake, on the other hand, could convey confidence, stability and trustworthiness and open up new dialogues and friendships between leaders that have long been opponents. If you are a business person your handshake can be the maker or breaker of a big contract or deal. If you are a doctor or health care provider your handshake can fill a patient with confidence and trust. It is extremely important for all people, regardless of your race or way of life, to learn how to shake hands with meaning. In 2004 there was a big election in Australia. The current Prime Minster was John Howard and he had lost a lot of public trust after agreeing to follow Bush into Iraq and Afghanistan. Many people thought he was going to lose the election after being in office for years. His political opponent in the election was a newcomer on the scene called Mark Latham. He had injected a bit of vitality into the opposition party and local political commentators thought he had a good shot at getting into power. But one handshake ruined it all. A few days before the election John Howard and Mark Latham met at a radio interview and Latham shook the Prime Minister’s hand in a very aggressive manner – pulling him close and staring him down. Footage of the handshake spread like wildfire and it was all over the news for weeks. Although public opinion of John Howard was at an all time low, people thought Mark Latham was a bully for the way he “roughed up” the PM. Latham lost the election. Lost it in a landslide. After the election the polls showed that the major reason people voted against Latham was because of his overly aggressive handshake. One handshake lost him the election. This is the only footage of the handshake that I could find. It starts at 1:54. The short bald guy on the right is Prime Minster Howard. Take a look at how Latham pulls him right up close and stares him in the eyes. This is how you should shake hands if you want to lose an election. 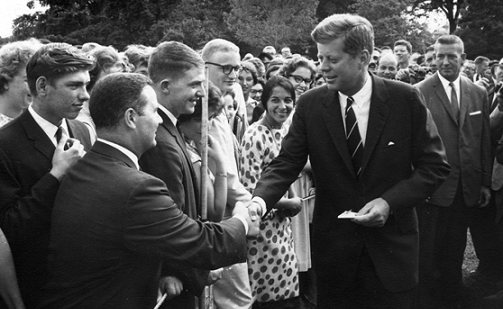 JFK’s study into handshakes found that the most effective handshake was the “double handshake” where the left hand is placed under the right hand to “cup” the clasped hands. Positioning the left hand in this way adds an extra dimension of enthusiasm and trust to the shake and conveys a great sense of friendship and trust in the other person. The position of your eyes is almost as important as the hands themselves. In fact, many leading business men and women will tell you that it is your eyes that convey the most about you during that initial point of contact. If you look down to the ground you are telling the person that you are shy, nervous and even untrustworthy. Avoiding eye contact is behavior typically seen in someone who has done something wrong and feels ashamed of guilty. Looking the person in the eyes shows that you are engaging them. It shows that you are interested in this meeting and you are glad to see them. Always make sure you look a person in the eyes when you shake their hand, no matter how busy or brief the handshake might be. The key element of a good handshake is a firm grip. A soft grip doesn’t speak very good things and sometimes people will take it to mean that you are weak of character or not really interested in the person with whom you are shaking hands. A firm grip, on the other hand, shows confidence, strength and enthusiasm. Is shows you are keen to get involved with the person and you are firmly committed to being there. Be careful not to go overboard though, a bone crushing grip can appear extremely arrogant. A handshake should be inviting but not rushed. When you rush a handshake you inevitably get caught in that embarrassingly halfhearted position where neither person is really gripping properly. When you go in for a handshake offer your hand with your fingers straight and your thumb high and make sure you do not grip until the person’s thumb is firmly locked next to yours. You should also not be too hasty in letting go. Germ freaks like Donald Trump often let go quickly and it is seen by many people as a big insult. If you can’t even shake my hand how can we develop a trusting relationship? Make sure you hold on for long enough to show the person that you are excited to meet them. I know it is called a handshake but the term is a little bit misleading. One of the worst handshakes you can get is the one where the person shakes your arm like they are trying to tear it off. Not a good idea. Perhaps think of it more as a handgrip instead of a handshake. It is fine to do two or three small shakes but that is enough. Too much shaking can convey over-excitment and in some cases it gives the impression that you are desperate. You never want to be portraying yourself as desperate, even if you are. Make sure you don’t overdo the shaking. JFK thought the best place for the left hand was cupped under the shaking hands. However, this might not always be appropriate. The JFK cupped left hand is really quite an intimate grip. It is something you would do to someone you really admire or an old business friend that you haven’t seen in years. JFK correctly used it on foreign leaders, party donors, etc. Personally, however, I do not think the double handed shake is always appropriate. For example, I would never use the JFK double shake when introducing myself for the first time to a new client who was older than me. It can come across as a little enthusiastic. But you should use the left hand. Humans are intimate beings and (with a few rare exceptions) love to be physically interacted with. When I meet a new client I give a firm shake with my right hand and use the left hand to touch them on the shoulder or elbow region. If you are shaking hands to say goodbye to someone you can use your left hand to pat them on the upper back as they walk away. This physical details are extremely important. But sometimes the “correct” use of the left hand is not to use it at all. You will find yourself in certain situations where it might not be appropriate to do anything other than give a quick shake with your right hand. Make sure you use your own intelligence to determine the best use of the left hand. One place where the JFK shake is really very good is when you have just reached and agreement or a deal with a person and you want to express your happiness. Remember, the act of shaking hands is more than just the two hands meeting. It involves eye contact, shoulder touching, a firm grip, and many other factors. One thing you should never forget to do when shaking someone’s hand is use your speech in conjunction with the handshake. The most important speech to remember when shaking hands is the person’s name. ALWAYS call them by their name and never use lazy substitutes like “mate”, “brother” or “dude”. People love to hear their own name. When you shake a person’s hand and greet them by their name you are effectively saying “you are important enough to me that I bothered to remember your name”. Using a word like “mate” shows you don’t really care. A long time ago my father (a big time business man) took me out to a golf game. He told me I would be meeting a lot of high powered men from around the country. He told me to pay attention to their names and remember them as if my life depended on it. He also told me to pay attention to the men who greeted him by his name and the men who greeted him by saying “mate” or some other nick name. As it so happened, the guys who used nicknames were 100% of the time the guys that nobody else in the group really interacted with and on several occasions they were even disparaged as being untrustworthy. In the car on the way home my father told me that 50% of a business deal is done in the initial handshake and remembering the person’s name is the most important part of that handshake. He was on to something. You can take this theory one step further and remember a fact about the person’s life. If, for example, you know that the person just bought a new Mercedes Benz you can shake their hand and say something like, “Great to see you again John. How’s that Mercedes treating you?”. This is a fantastic way to show you are interested. When you use your speech in conjunction with the handshake you are interacting with the person physically, verbally and emotionally. A triple header handshake like this leaves an impression. Another trick my father taught me is to remind people of your name as soon as you shake their hand. It is important to realize that other people want to remember your name just as much as you want to remember theirs – nobody likes forgetting a name. If you have met a person before try to give them a little reminder as you shake their hand. You could say something like, “David Johnson. Great to see you again John.” This will help to put them at ease and hopefully make the meeting a little more streamlined. The handshake is extremely important to our society. Peace treaties have been promised over a handshake. Wars have been ended by a handshake. Great business deals have begun because of a good handshake. Make sure you follow the tips above whenever you shake someone’s hand. A good handshake is a first impression that will last a long time in person’s mind. This was a great article. There are a couple of things that need further consideration in order for this to be a complete treatise on a good handshake. First, the points made are most relevant in WESTERN culture. For example, when meeting people in Japan for example; looking people directly in the eyes is a sign of crude manners. Its thought to be too personal, rude and a sign of arrogance. So,if you are going to visit countries in southeast asia, study local customs beforehand. Also, while avoiding eye contact may be a sign of guilt or of an untrustworthy character; it may also simply be the case that the person is a “kinesthetic type”. Thanks to brain research and the science of Neuro Linguistic programming, we are aware that people access their brain centers differently . If asked a question , a kinesthetic type will generally look away or look down-particularly if the aim of the question is to determine how the person FEELS- about something. Great comments Robert. Thanks for pointing the one about eye contact out. I want to add that women in particular should study up on these tips. As a young woman myself, I’ve actually been complimented a number of times on my handshake (by other women and men) and I’ve found that a confident, good handshake really seals a good first impression, especially in professional settings. Robert — I hadn’t heard of kinesthetic type until I read your comment. After reading up about it, I feel less crazy about my learning style and my tendency to gaze at objects, rather than in people’s eyes, while having a conversation. I frequently must remind myself to make eye contact. I am going to use this in 2 HS classes. My students NEED this information and you have the right mix of history and how-to. We’ll be practicing all quarter. Good article. I noticed that since becoming older and more confident / dominant I rarely shake hands without involving my left hand in some way. I find it seals the nature of your relationship, just in case there was any doubt caused by slippage, the other trying to crush your hand, the other gripping to early (i.e. around the fingers rather than the palm) etc. “the science of Neuro Linguistic programming” is certainly not a science, despite its science-y sounding name and psuedo-scientific principles. Don’t be fooled. There are some ridiculous statements in this article. “Your handshake speaks volumes about who you are as a person”. Like hell it does. No, what it should say is that “Some people will extrapolate who you are as a person based on your handshake”, or something like that. What I’m saying is that your handshake does not necessarily reflect “who you are as a person”. If it did, we wouldn’t need articles like this, would we? Think about it: If I read this article and come out of it with a whole different type of handshake, have I changed as a person? Or have I merely learned a different way to shake hands? Also, the article doesn’t seem to mention the offering of a handshake. By this I mean… Who should offer to shake hands first? I was taught that the person of lower authority should wait for the other person to offer their hand first; in this way, they were being deferential. Realy great stuff! Before reading this article handshake was not so important for me but now i’ll practice it out and make my handshake perfect! Thanks a lot!